Throughout history, people have vanished with no explanation. A group of teenagers are about to discover why. Cade is settling into a new boarding school, contemplating his future, when he finds himself transported to another realm. He soon discovers their new world is populated with lost remnants from the past: prehistoric creatures, ancient relics, and stranger still—people. 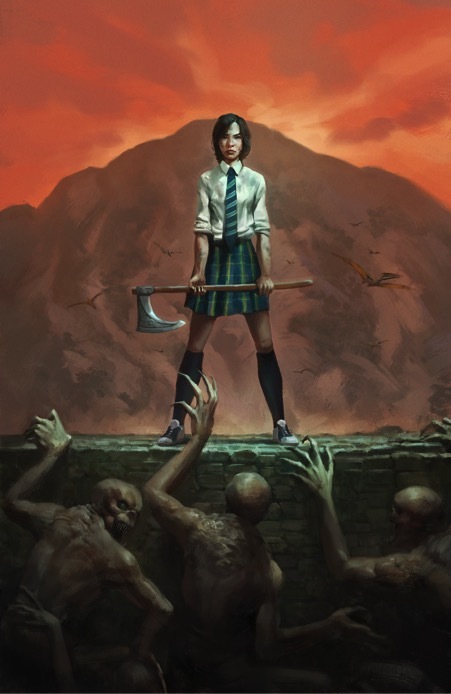 Overwhelmed by his new surroundings, Cade has little time to adjust, for soon he and his fellow classmates are forced to become contenders in a brutal game, controlled by mysterious overlords. But who are these beings and why did they choose these teens? Cade must prepare for battle… because hiding is not an option. 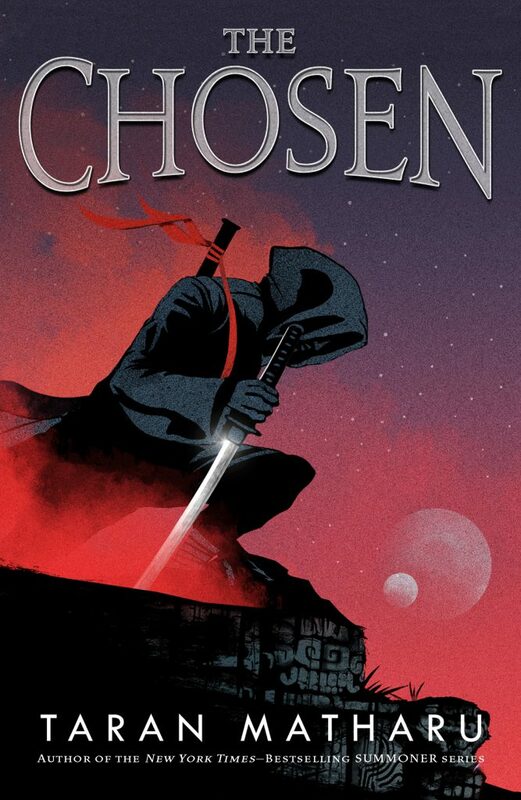 The world of The Chosen is rich with history, and is grounded in over five years of researching missing persons, lost artifacts and humanity’s forgotten past. Whether entire armies that marched to unknown fates, ancient cities once discovered and since lost to the mists of time, or treasure-laden ships that vanished without a trace, this realm is strewn with the answers to some of history’s greatest mysteries. 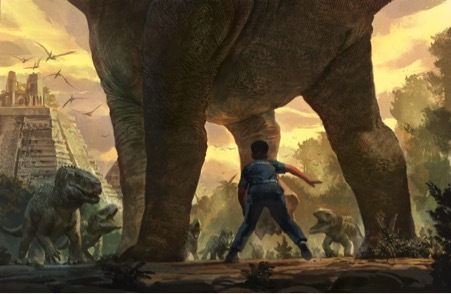 But Earth’s past is more than the sum of human achievement, and primeval creatures roam The Chosen’s jungles—taken from the full spectrum of Earth’s prehistoric beginnings. Here, dinosaurs are not all made up of a simple layer of green lizard skin over bone, but are unapologetically rendered with all the lumps, bumps, wattles, bristled spines, balloon-like vocal sacks, vivid skin-tones, and plumes of display feathers that today’s scientists know they bore. 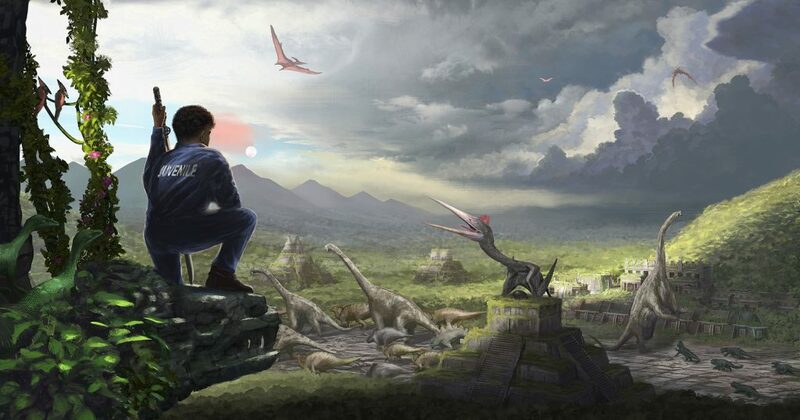 To create this world, I worked closely with some of the world’s best paleo-artists and digital painters. 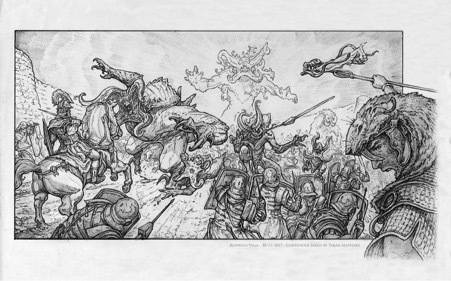 Here is just a small selection of some of The Chosen’s concept art. Richard the Lionheart’s lost crusader ships sail towards sauropods on a beach, with ichthyosaurs following in their wake. A kronosaurus jumps for a passing pterosaur in the foreground. Painting by Lukas Banas. 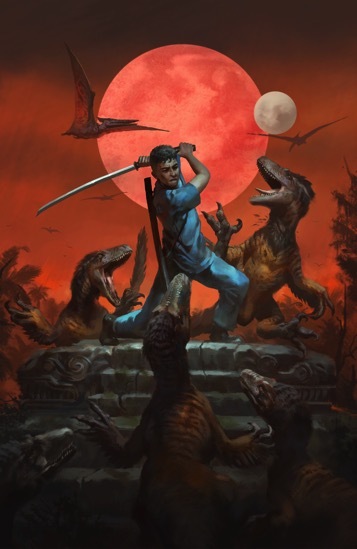 Cade fights a pack of deinonychus raptors atop a Mayan pyramid in the forgotten city of Hueitapalan, wielding the long-lost Honjo Masamune sword. Concept sketch by Rodrigo Vega. Painting by Raph Lomotan. Cade is trapped beneath a sauropod in the forgotten city of Hueitapalan. A pack of postuchuses approach. Concept sketch by Rodrigo Vega. Painting by Raph Lomotan. Cade looks over the forgotten city of Hueitapalan. A Quetzalcoatlus perches upon a pyramid, while a super-herd of herbivorous dinosaurs migrate through the central plaza. Painting by Matthew Sellers. 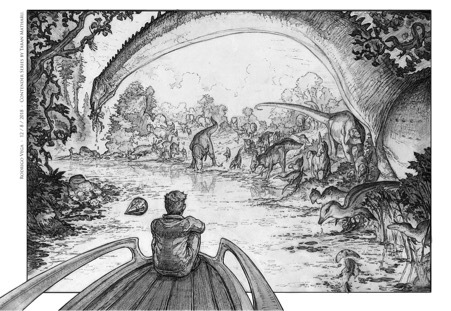 The disappeared cruiser, the Witchcraft, sails down a river, passing by a pair of stegosauruses and a diplocaulus. 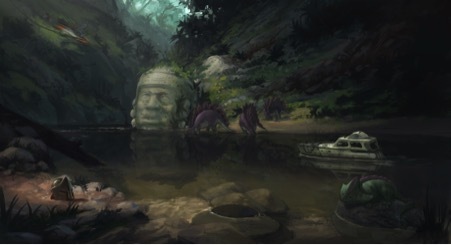 A giant Olmec head rests in the background, with a Meteor jet fighter that once belonged to David Atcherley lies crashed nearby. Painting by Lukas Banas. 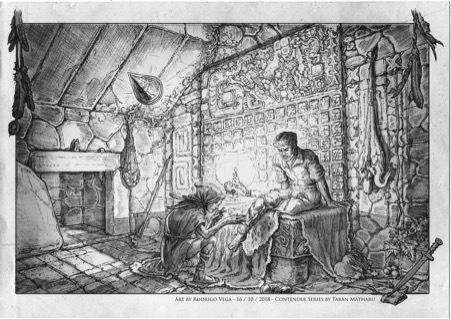 Cade has his wounds tended by a roman legionary inside a Mayan temple. Hunted compsognathuses hang from the wall. 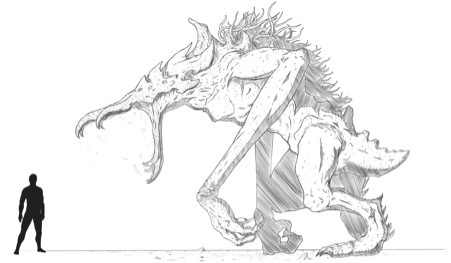 Sketch by Rodrigo Vega. Cade sits at the front of a long-lost cruiser, the Witchcraft, observing prehistoric fauna at a watering hole. Sketch by Rodrigo Vega. Creature concepts. Sketches by David North. 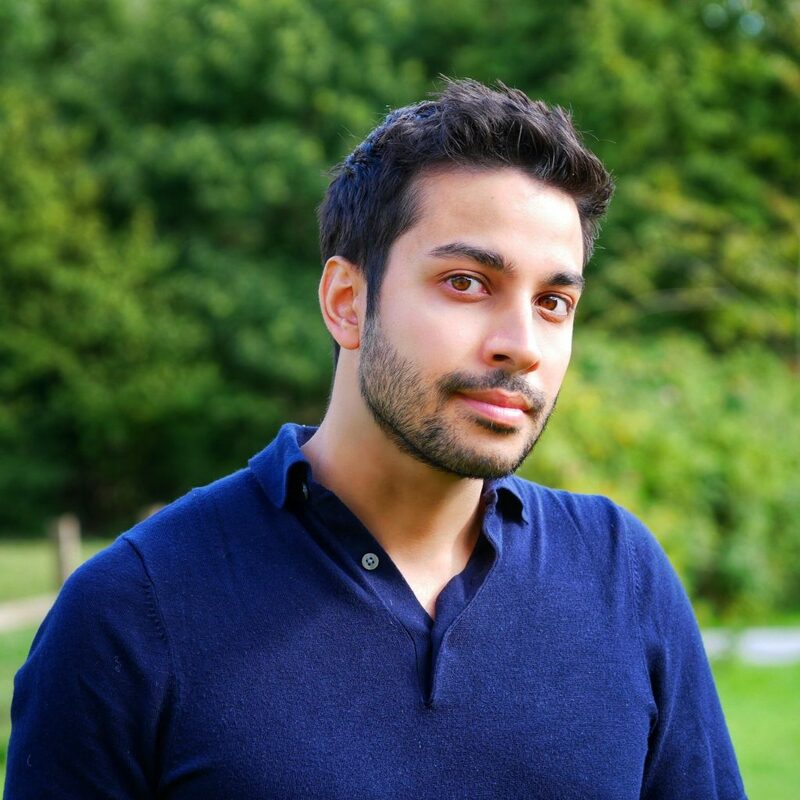 Taran Matharu is the New York Times bestselling author of the Summoner Series, which includes The Novice, The Inquisition, The Battlemage, and the prequel, The Outcast. His new series, called the Contender Series, is launching in June with The Chosen. You can learn more here, but it’s an epic survival adventure story that his fans are sure to devour!